Kenny Walker is an SC golf icon whose pace challenges all golfers, no matter their age. Kenny Walker was born in Massachusetts in 1936 but spent much of his youth in the textile town of Anniston, AL. Always a good student with an interest in the sciences, he earned a degree from Harvard. A new job in the growing plastics industry brought him to Greenville, SC, where he met a local girl who would become his wife. But, taking care of business came first, and Walker found that his growing passion for golf would play a significant role in both the journey and the ultimate destination of his life. “I took up the game in my late 20s,” he says, “because I saw that it would be a big asset to take prospects out for a round of golf. In fact, with thousands of manufacturers in the plastics business, I made a decision early on to focus on the companies run by people who were also golfers. It worked out very well. Kenny and Hila Walker moved into their new home in the Long Cove Club residential community in February 1991. Then, as now, the initial fee for club membership was built into the purchase price, so he was at the clubhouse and ready to play within days. But Walker’s vigorous pace of play isn’t the reason for his status as a local golf icon; it’s his Iron Man durability: He’s the acknowledged (if unofficial) all-time record holder on Long Cove Club course with more than 6,000 rounds played and counting. Over the years, Walker also got involved with club leadership by serving on the golf committee, then being elected club president in 1996-97. 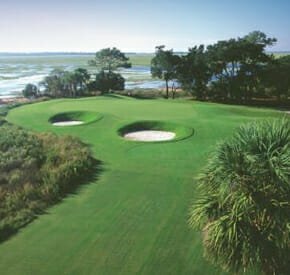 He introduced player-friendly changes in course operation—allowing walking rounds any time of the day and carts on the fairways for the benefit of older members—and other improvements that have kept Long Cove Club among the nation’s top-rated private clubs. He also developed a friendship with Pete Dye (“he’s a treasure”) during the course architect’s annual visits to the club and supported investment in a complete restoration of the golf course that was completed in October 2018. “They did an excellent job,” according to Walker. Now in his 82nd year, Walker has cut back his golf schedule to just two or three rounds a week, but enjoys the game and his playing companions just as much. Has that been his key to a healthy lifestyle? “Well, I was blessed with great genes, and I watch what I eat. We have a lot of seafood and fresh vegetables,” he says. “And I do enjoy a cocktail, not every night, but I’ll have one when I want one. “It’s no secret that I enjoy golf and being around people who make me laugh. I think that makes for a long and happy life,” Walker notes. “It’s important to do as much as you can to fill your life with the things you like to do and do them with people you enjoy. Being married to Hila is my greatest joy.” The Walkers recently celebrated their 58th anniversary and cherish time with their son and his family when they’re visiting from North Carolina, and their daughter and two grandchildren who now also live on Hilton Head Island. That choice of location seems to have played a role in his happy longevity as well. “Obviously, there’s been growth and a lot of changes since we moved here in 1991,” he says. “One new thing is that they’ve finally extended the runway at the Hilton Head Airport, so regional jets can fly in directly from Charlotte, and eventually Atlanta and other places. I think that will help to keep the island as a top retirement and vacation destination. But, one thing that hasn’t really changed that much is the natural character of the island. Hilton Head has done a magnificent job of maintaining the beauty of this place,” he concludes. Gracious and affable. Generous and polite. The folks at Long Cove Club will tell you that Kenny Walker is the kind of member who has made their community such a special place for so long. There was only one reason that he’d kindly point out that the hour allotted for this interview was up. He doesn’t want to be late for his tee time. With 26,000 total acres—the equivalent of 40 square miles or nearly twice the land area of Manhattan—Hot Springs Village in Arkansas is America’s largest gated community. Established in 1970 by Little Rock businessman John Cooper Sr. and developed by his family-owned Cooper Communities Inc. (CCI), Hot Springs Village was envisioned to be a major retirement community and golf destination in a central Arkansas area that had neither. But Cooper was also an environmentalist who wrote into the original Village covenants that at least 40% of the development had to remain forever as common areas or otherwise undeveloped land. And by 1975, as the first few hundred lots were sold and retirement homes were built, CCI helped to create the Hot Springs Village Property Owners Association (HSVPOA) and a unique partnership began. Over the next three decades, the Village grew steadily with retirees from neighboring states and Midwestern cities like Chicago and Detroit. Between 1979 and 2004, nine golf courses were built at scattered locations among the community’s meadows and woodlands, each with its own clubhouse and restaurant. The 11 on-site recreational lakes covering more than 2,000 acres and nearly 30 miles of internal nature trails proved to be equally popular recreational amenities. 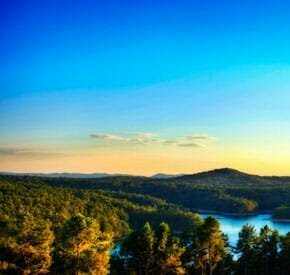 And, serious anglers and hikers soon discovered a paradise right next door in the pristine 1.8 million-acre Ouachita National Forest and its huge centerpiece lake with waters among the cleanest in America. Additional facilities were built as the Village prospered: the 654-seat Woodlands Auditorium performing-arts venue, an anchor of an activity center that includes the new Grove Park Amphitheater and Casa de Carta, home to one of the nation’s largest bridge clubs; The Coronado Community Center with its own 300-seat auditorium, a lending library, and meeting space for what would become more than 100 community clubs and organizations; a fitness center with indoor pool and workout facilities; a tennis center with additional pickleball and bocce ball courts; two full-service marinas; and 25 churches serving 15 denominations. Residents also participate in dozens of volunteer organizations with an outreach well beyond the community gates. Village infrastructure grew with its population. There are 501 miles of roads maintained by the HSV public works department, which also operates the recently expanded freshwater plant at a 12th community lake reserved for drinking water, plus two wastewater-treatment facilities. The Village also has its own police and fire departments located in four community substations, contracts for ambulance services with on-site paramedics, handles its own permitting and inspections, and even runs an on-site animal shelter. For all of these amenities and services, the annual assessment set by a vote of the Hot Springs Village property owners is currently around $780. Today, there are more than 31,000 HSV property owners, about 14,000 of whom live in the Village year-round in 9,000 mostly single-family homes. It’s large enough to qualify as its own Census Enumerated District and could be an incorporated municipality, but it’s not. Hot Springs Village is a different kind of democracy. Over the years, the working relationship between the original CCI developers and the HSV Property Owners Association evolved, with the latter taking on more and more responsibility. And, in recent years, CCI has turned over all operational control and ownership of most of the common areas and facilities to the POA—meaning that the property owners are in charge at Hot Springs Village, a huge benefit and responsibility in equal measure. Thus began a community-wide engagement with the property owners resulting in the 2018 Hot Springs Village Comprehensive Master Plan. During a year-long process that included outside consultants like DPZ and Crafton Tull, a 22-member volunteer POA committee and the Village planning staff, three surveys were sent out, and community meetings were organized to get as much input as possible. More than 4,000 completed surveys were returned, and hundreds turned out for a series of workshops, supplemented by personal conversations, phone calls, and emails to directors, committee members, and staffers. Offer new housing options for retirees and working families. Because POA members set their own annual assessments to pay for Village operations, they have a vested interest in keeping costs down and generating new revenue. One option to achieve the latter—supported by 80% of survey respondents—is to establish an enhanced Town Center in the existing Woodlands Auditorium area. There is relatively little commercial development within the Village gates, but the central location of the Woodlands Town Center makes it an ideal place for a grocery store, specialty shops, professional-service offices, restaurants, and even a hotel. Lease revenue from those businesses could make a significant contribution to the Village balance sheet, as would sales or rental income from more urban-style townhomes, condominiums, or apartments for retirees looking to downsize, as well as younger workers. But, the plan doesn’t call for putting those eggs in a single basket: areas around the Coronado Center and Carmona Center could be similarly developed, albeit on a smaller scale, with clustered housing, neighborhood markets, cafés, and shops. All three areas would be walkable by design and connected by extended leisure paths, with choice areas reserved for parks and open space. The Comprehensive Master Plan also focuses on future residential development in Hot Springs Village, with an eye toward both preserving existing property values and attracting new residents. Areas near the three primary activity centers already substantially developed should be prioritized for home site sales, while new pocket neighborhoods with smaller homes should be encouraged, thereby enhancing future housing options for new buyers. At the same time, some platted lots could be combined to create larger home sites, while others could be taken off the market to create pocket parks in keeping with the established natural character of the Village. Perhaps most remarkably, the plan advocates suspending sales of more than 5,000 lots (about 17% of the total) not only in perimeter areas with little existing development but also in large areas of partially-built neighborhoods, especially those lots in existing drainageways or on steep topography. This proposal would reduce the current oversupply of properties, while significantly expanding dedicated natural areas. Among the other property owners’ desires reflected in the plan are the establishment of a consolidated medical complex within the Village with corresponding shuttle service and expansion of the Lifelong Learning Institute programs. New marketing initiatives are also recommended and one is already in place: the new website at Explore TheVillage.com includes overviews of community real estate and amenities, information about new Discovery Tour packages, and a link to the 2018 HSV Comprehensive Master Plan. Maybe life really does begin at 50. The folks at Hot Springs Village certainly think so. Hot Springs Village was designed from the start to be both a retirement community and a golf destination. 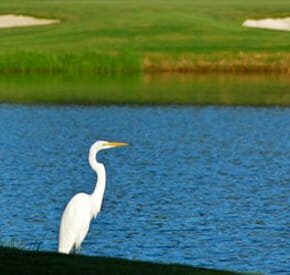 The plan was that residents and visitors could share the cost of creating an unrivaled family of Arkansas championship courses. It worked. rea in 1541, so the first Village golf course to open in 1972 was named for him. A theme was thus established and the Cortez (1979), Coronado (1982), Balboa (1987), Ponce de Leon (1991), Magellan (1996), Isabella (2000), and Granada (2004) followed. All eight golf courses are 18-hole layouts, except the 27-hole Isabella with her Nina, Pinta, and Santa Maria nines. All were designed by the acclaimed architects at Ault, Clark & Associates. Each was built on a distinctive tract of pristine land, some featuring multiple lakefront holes, others offering sweeping views of the Ouachita Mountains. Many have been ranked among the state’s best courses by leading golf publications and have hosted numerous tournament events. All have been consistently refurbished over the years and are maintained to the highest playability and environmental-impact standards. The ninth HSV course—Diamante—opened in 1995 as a private country club. It’s separately owned by its members, managed by Kemper Golf, and has been ranked among Arkansas’ top private courses since its debut. The other eight Village courses are owned and operated by the HSV Property Owners Association. Director of Golf Tom Heffer, Director of Agronomy Gary Myers, and their staffs manage day-to-day operations, while a standing committee makes policy and budget recommendations. Visiting players from around the region and nearby Hot Springs vacation destinations pay an average greens fee of $65, which is quite reasonable for a top-flight resort course and contributes to the Village’s golf bottom line. So much so, in fact, that Hot Springs Village property owners enjoy unlimited play on all eight courses for a single annual fee of just $2,190. (That’s not a misprint: $2,190!) It’s hard to imagine a better value in American golf and unsurprising that HSV residents take full advantage; they account for about 85% of the 243,000 annual rounds played, and up to a thousand are weekly tournament participants in the seven Village golf associations for men, women, couples, and juniors. The daily fees paid by visiting golfers and the residents’ annual contributions combine to substantially fund operation of the Village courses. As a result, the 2018 HSV Comprehensive Master Plan recommends no changes to the current program. However, new resident golfers attracted by contemporary housing options, plus increased visitor play with on-site accommodations like a Woodlands Town Center hotel, could actually make golf a community profit center in the future. And, POA members will still own their eight Hot Springs Village golf courses—which makes that $2,190 a year an even sweeter deal. The Cliffs at Glassy is a private residential community in upstate South Carolina with a spectacular centerpiece golf course. 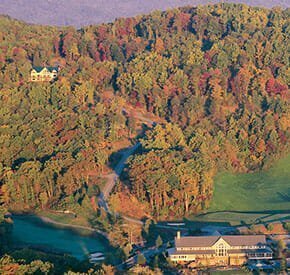 Set atop Glassy Mountain at elevations up to 3,200 feet, the panoramic views of Blue Ridge peaks and lush highland valleys are simply stunning. A little warmer in the winter sunshine and definitely even milder in summer than the surrounding protected woodlands, the red-and-gold autumn scenery up there is as cool as the crisp mountain air. The Cliffs at Glassy layout isn’t just another pretty face. Course architect Tom Jackson designed it so that proud members and their awed guests could put up a good score from the forward tees, while scratch players find plenty of worthy challenges from the tournament tees on the flawless bentgrass fairways and greens. Afterward, everyone can enjoy socializing in the member clubhouse over a gourmet dinner following refreshments and another glorious sunset. Golf Digest named these as ”America’s Most Scenic Golf Courses:” Pebble Beach, Augusta National, Cypress Point, and The Cliffs at Glassy.